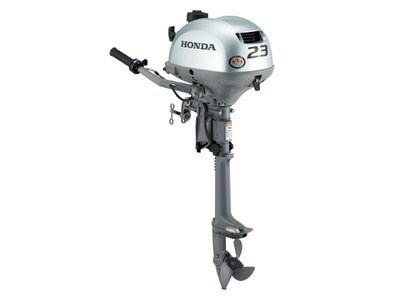 Honda Marine BF2.3 L Type The world's lightest 4-stroke outboard with world-class fuel economy, the BF2.3 is ideal for tenders, small fishing boats or as auxiliary power. Quiet and simple to run with its automatic clutch, it also gives you incredible versatility and convenience thanks to the Shallow-Water Drive, Fold-Down Tiller Handle and Integrated Fuel Tank. Features may include: Four-Stroke Engine Design World-renowned Honda quality combines proven reliability with no oil-gasoline mixing. Centrifugal Clutch Honda's centrifugal clutch facilitates the running of the engine at idle, with no propeller rotation, for tight navigation or just idling at the dock. Lightweight, Compact Design Easily transportable, this little outboard is ideal for small boats, dinghies and canoes. Lightweight 4-stroke design and is the only 4-stroke in the 2.3-hp class. Transistorized Ignition Maintenance-free, high-energy output for quick and easy starting. Forced-Air Cooled Engine No water pump to worry about being plugged with weeds or damaged by sand, and less weight to carry. Emergency Stop Switch and Lanyard Standard safety feature allows the operator to clip the safety switch lanyard or tether to his or her wrist, which will automatically activate the engine stop switch if the operator leaves the helm. Shallow-Water Drive Reduces the risk of engine damage while navigating in shallow water. Sacrificial Anode A sacrificial anode mounted on the lower unit protects other metal components from corrosion. Three-Year Warranty The best outboards in the industry are backed by the best warranty in the business, 3 years parts and labour. Two Models to Choose From The BF2.3DK2SCHC and BF2.3DK2LCHC models have a centrifugal drive clutch, which offers a neutral-gear position at idle. Both models have a tiller-mounted twist grip throttle/360° swivel steering. 360º Degree Swivel Steering Provides excellent manoeuvrability in tight areas. Integral Fuel Tank Facilitates easy removal and portability as one unit. Vent may be closed for transport or extended storage periods. Carburetor Drain Screw Allows quick and easy draining of the carburetor's float bowl for transport or extended storage periods. Twist Grip Throttle with Friction Adjuster Allows for superior throttle control, and the throttle tensioner minimizes driver fatigue. Large Front-Mounted Carrying Handle Provides superior portability and ease of installation. Fold-Down Tiller Handle A more compact design allows for easy transportation and storage. Available In Two Shaft Lengths Standard 15" or 20" shaft lengths allow for a wider range of boat applications. Sale price does not include freight, pdi and applicable taxes.